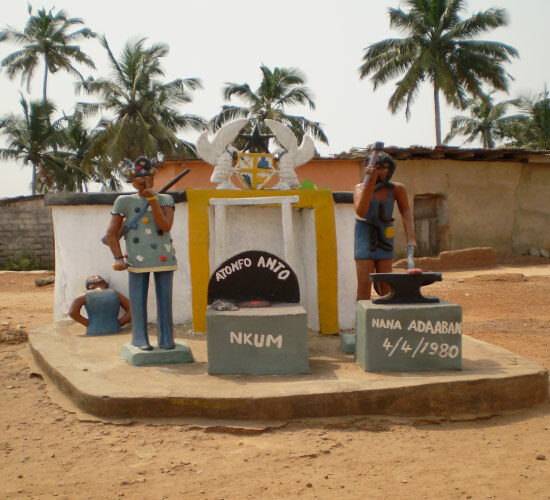 The community shrine, posuban, of Kormantse Nkum depicting the abode of Nana Adaaban as an iron monger at his forge, a mud furnace and an admonishing Supi Amiansah. The busts of two men about to be beheaded in the background are ‘believed’ to be the reconstruction of punishment of two captive enemies. At the masthead is the coat of arms of Ghana, a more recent addition. The relevance of such shrines, dotted along coastal Fante and further inland is underscored by the Fanti aphorism which states that: a town without a pusuban is no town. The saying means that a town without a pusuban never engaged in warfare and consequently has no history. 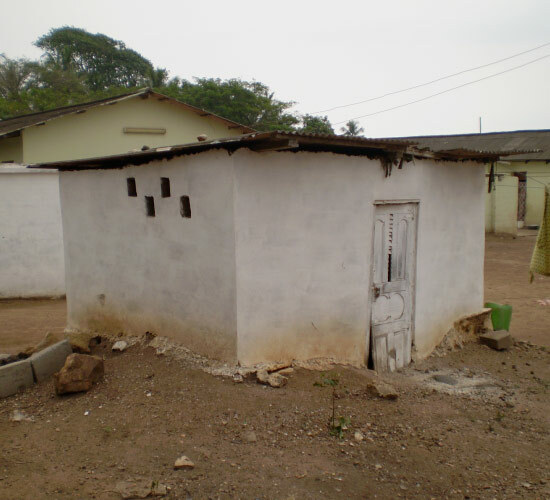 This is a picture of the Kormantse Nkum asafo pusuban rebuilt as recently as 1973. It has a multiplicity of proverbial statues, symbolic motifs and representations. Supi Samanpa and the two asafo company members depict the military antecedents of the pusuban. The outfit of the horse riders is a manifestation of the discipline of the Kormantse Nkum asafo company, but this sits atop the Ghanaian proverb that “if the horse is mad, its jockey is not mad.” This is in obvious remonstration with known adversaries of the Kormantse Nkum people. The Nkum pusuban is a fortress guarded by two leopards-twi, two cannons and the naval vessel MV Kormantse. This ship alludes to slave trade and the role of Kormantse in the trade. 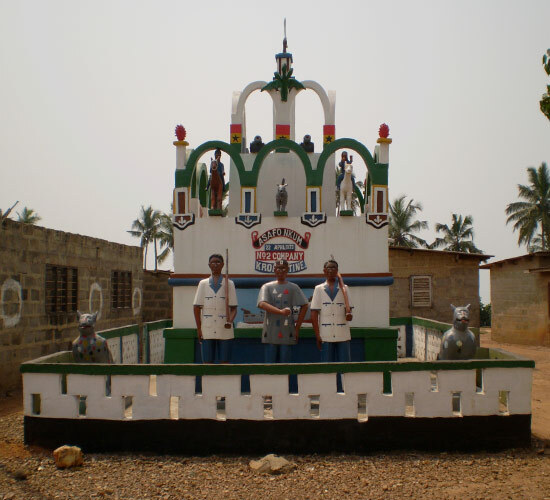 This shrine is known simply as Esiwdo and it belonged to the community of Kormantse. 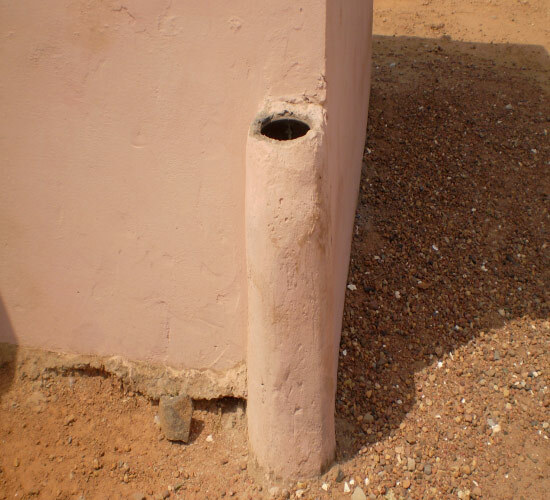 It was used as a place where a new Safohene went to swear the oath of allegiance to the entire community. Water was applied to the clay coating and used to mark the upper arm of the one being initiated. Also, when by-laws are passed to govern the community, they were ratified at Esiwdo and thereby made enforceable. 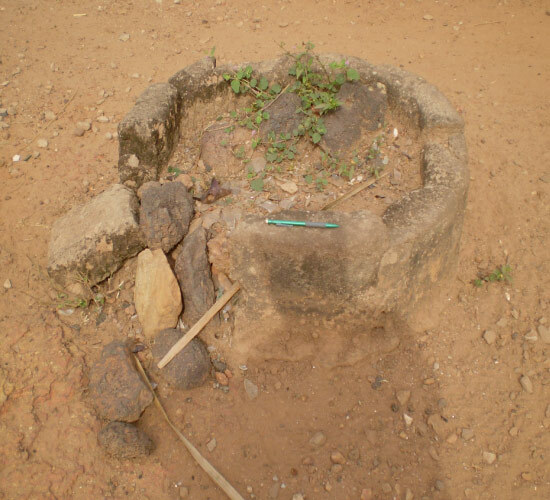 Abusua akor or altar which belongs to the Ekona abusua of Kormantse. 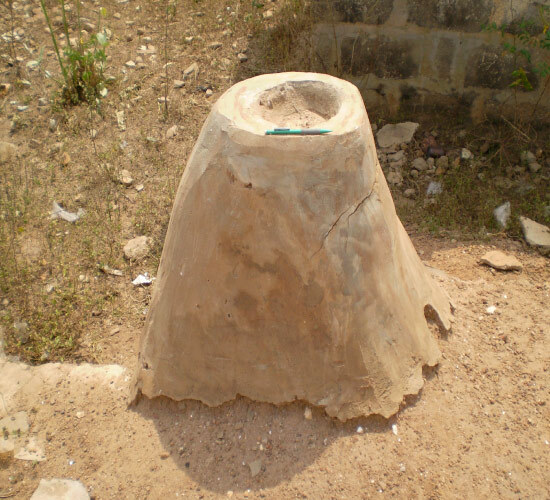 It is also known as akongwa dan because it represents the akona abusua stool in this community. The altar is meant to guard the members of the clan. Individual clan members can pour water or alcohol in the receptacle and solicit blessings from the clan deity. 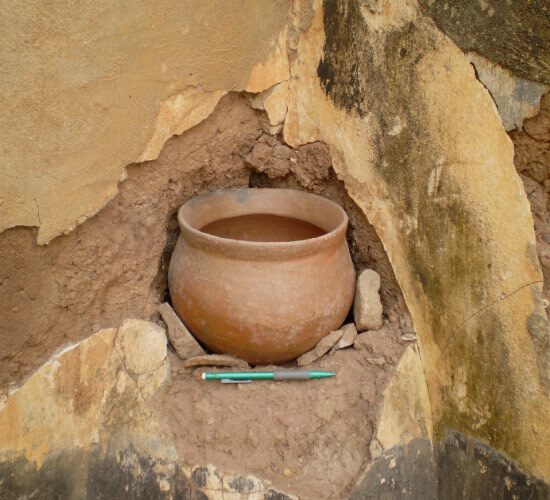 Nkyen dan or store room for Bentsir asafo drums and believed to be governed by Nana Amissah the principal deity of Bentsir Asafo. Drums used for war are kept here and before they are moved out, blessings were sought from Nana Amissah who was believed to assist the paramilitary force on their expeditions in other jurisdictions. This is Safohene siw shrine, a place where Nana Eguasaman of Kormantse Nkum swore her oath to assume duty as Safohene of the Nkum paramilitary force. 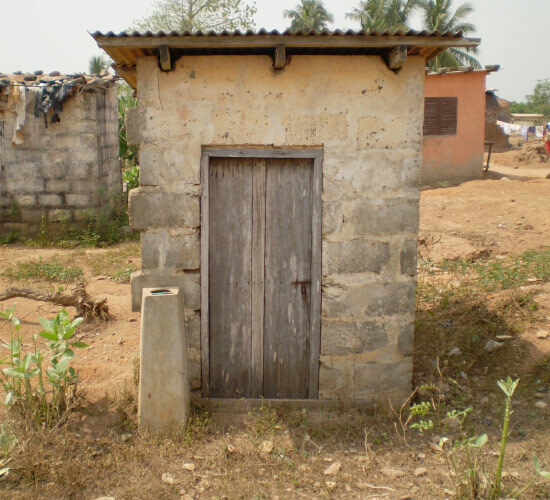 The siw was built in 2008 in honor of their illustrious female Safohene who lived to a ripe old age. 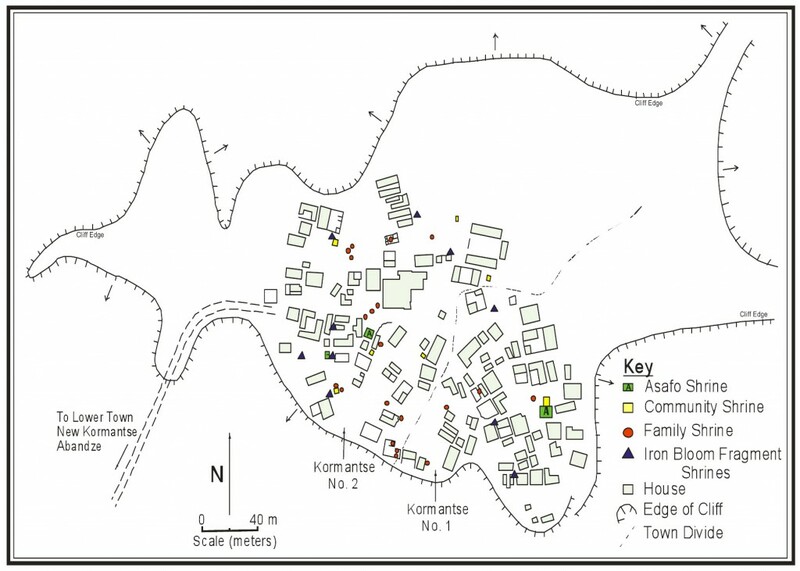 At the end of the year when the asafo embarks on a procession through the town, they end up at the siw, pour libation and use mud to make marks on the upper lower arm of the successor. Nana Ebufi deity belonging to the Twidan abusua (Clan). It exists to protect members of the clan. 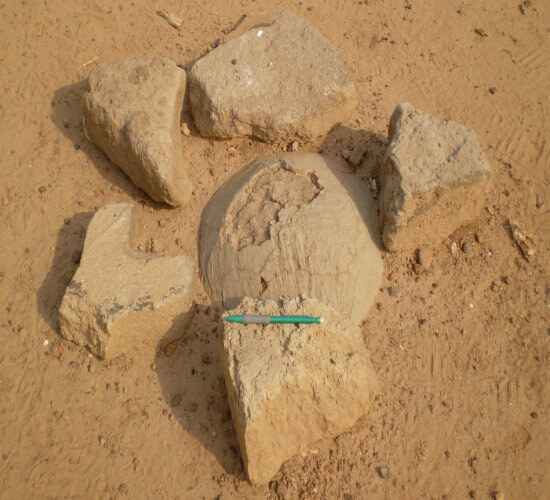 Egona abusua akor or altar. 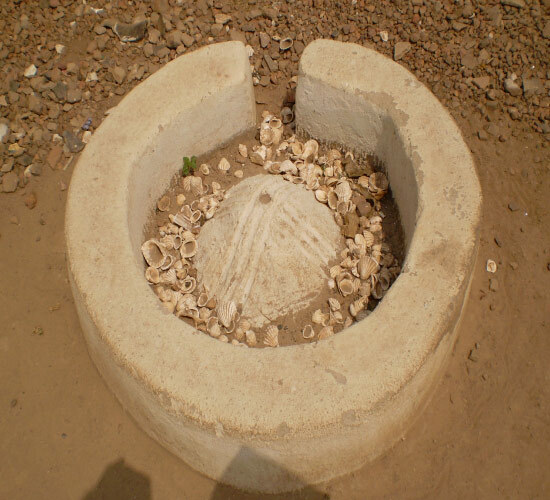 It is a place for pouring libation to the spirit ancestors of the Egona abusua.